Choose the box style, enter the box dimensions and position the backguide as directed. That’s it. You can make the box in seconds. You don’t have to wait for someone to deliver 500 boxes when you only need 50. You don’t have to store and inventory 450 extra boxes indefinitely. Dial the digital counter to the dimension you require. That’s it! The SLTR machine will pull the sheet through cutting the dimension you require. Cut a master sheet into a number of the desired size in only a few seconds. Optional scoring tools, if desired, can be added in seconds. The SLTR’s extra large table surface and deep cantilever design allow for cutting the largest of sheets. The variable speed drive allows for maximum control. Entry and Exit table surfaces are polished stainless steel for minimal drag. The backguide’s channel design helps keep the sheet square as it travels through the cutting knives. The two driven rotary knives kiss at an angle providing a clean, professional cut. 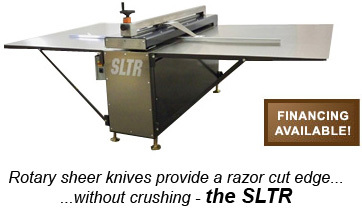 Compare to a straight edge and razor knife… SLTR – Safer and much faster. Compare to a bandsaw or table saw… SLTR – Smooth, professional cut with virtually no dust. Compare to a bar slitter… SLTR – Smaller footprint, set up and run 50-75 sheets before you can get the bar slitter set up. Optional Creasing Tools can be used to crease while slitting. Optional Angle Forms can be used for angle cuts.